In midst of my struggle to find purpose in life as a young 23 year old caught up in drugs, alcohol, lying, stealing, and anger, I stumbled across a young lady who I had no idea would help in a transformation process that would reshape my life into a life of hope and a life of love. It was at the unlikeliest of places on Sunday, July 12, 1992 at Club Velvet in Atlanta where I would start my journey. Who would of thought that God would be at Disco Hell Night where He would lead me and Joy out of that culture. It was there that I met Joy on the dance floor. I saw her from across the dance floor with her eyes gazing upon me. I was like, “Hellooooo.” Then I looked around me to make sure it was me that she was looking at. On a crowded dance floor, you never want to assume that a girl is looking at you and then you make your move and you get dissed. But after a few minutes I knew she was looking at me and then I made my way over to her. After dancing with her a few minutes she said she was thirsty so she grabbed my hand and led me off the dance floor to go to the bar. The first thing she asked me when we got to the bar was “What nationality are you?” In my best country accent I could muster, I said: “I’m Merican.” She smiled and we hit it off. We talked for a while and enjoyed our conversation together. This was the first time in a long while that I wasn’t thinking of anything selfish while being with a girl. I just wanted to talk with her and I loved her smile right off the bat. It was weird, even in the midst of a sinful place where we were at, God was drawing us close because He had a greater purpose for us. I want to make sure you understand that I do not think that God wants us in bars, drinking and dancing to music that engages the senses of self-pleasure seeking. God does not want us to engage in sinful behavior and go to places for pleasure that are not good for our soul. Some young people think that just because Joy and I met at a bar that they could find their soulmate there too. They want to play with the fallen one. But I want to emphasize to you that God’s will is for you to be free from sin and to meet a man or woman that will want that in their lives too. You don’t find that in bars and clubs and I sure wasn’t in that mindset. Joy had wavered in her faith after going to college and I found her in that state of mind. Me? I didn’t believe in God. So there we were, two people destined to be together and to walk with God in an unsuspecting place where you would think that God was not present. I do not believe that God desired us to be there. I do believe that God used our circumstances to get two people out of there to help Him spread the gospel. I called her the next day and we went out. And then again…. And again. I loved talking with her and loved being around her. Even though she was not 100% committed to her faith, I still felt a peace about her that intrigued me and I wanted to be around her all the time. After about four months being with her, I was already in love. After about six months with me, she was falling in love. Many months went by and we were drawing closer together. Joy knew in her heart that she needed to get back to church. 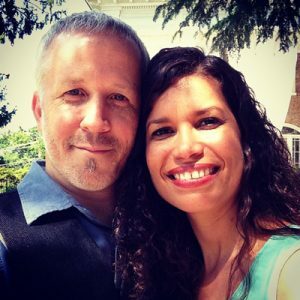 She knew that if she was going to spend the rest of her life with me, I would have to love God. So she asked me to come to church with her. I wanted to be everywhere with her so of course I wanted to go to church with her. I remember walking into church with the same attitude I would walk into a club. I was used to fending off other guys trying to hit on her and I went into church with the same attitude. I was still an angry young man who knew not the Giver of peace. But after going to church with her many times, I started to hear words that would draw me towards a God who loved me regardless of how I was. I started to understand how much He loves me and I began to find purpose. We had Bible studies together and I enjoyed drilling my words at the elder who was giving us our studies. But he was so patient and kind towards me and showed me the love of God with how he treated me. Our baptism together, dedicating our lives to God. Eventually, Joy revealed to her parents that she had been dating me and by then I had asked her to marry me. There was nothing fancy nor was there a heartfelt story to tell about our engagement. We just knew that we were meant to be together. Several months after telling her parents that we were dating, I was to come to FL to visit her parents with her and to ask for their blessing on the marriage. The day after I met her parents I asked for her father’s blessing. He could not give it, and rightfully so, because I was not a Christian, but he admitted that Joy was a strong young woman and could do whatever she wanted. I made sure to let her father know that I would not join the church or be a Christian just to marry her daughter. I knew that my heart was falling in love with God, but I had not made a commitment to Him yet. Months went by and Papi, Joy’s father, and I began to bond well. 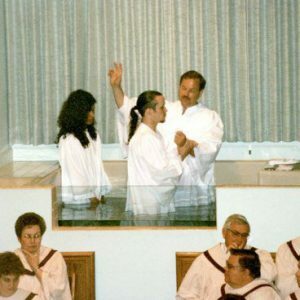 Two weeks before Joy and I got married I was baptized and she was re-baptized. I am forever thankful of her part in helping me to see Jesus. 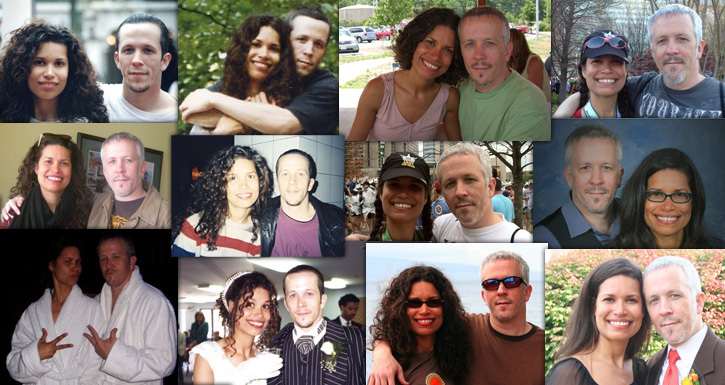 Through the years, God taught me how to love my wife. I wasn’t really good at it at first, but God helped me to see how much He loves me and then in return I have been able to apply that love towards her the way God wants me to do so. The life we share together has had its ups and downs. But it has been the life struggles and challenges that we have faced that have made our marriage stronger and it has been the presence of God that has made our marriage inseparable. Joy causes me to be a better person. Her drive in life inspires me to go further. Her commitment to people in her life shows me what loyalty means. And did I tell you about her smile? I could close my eyes and see her smiling face and it always warms my heart. I’ll be the first one to admit that I don’t always have things together, but she helps disguise that by her presence in my life. To this day, I still want to always be around her. And to think… 20 years is not enough time with her. I am definitely looking forward to eternity with her. Congrats Joyce. May God continue to bless u!!! !